…Is it wrong that my favorite part about this page is that it has an excerpt from You’re a Good Man, Charlie Brown? …And that it’s the reason I’m commenting for the first time? No. No shame. No wrongness. If it is, I don’t want to be right…. Ron no longer has Atlas Jr. powers. Now he has Quantum Mechanics! But I hope he never gives up being Captain Clarinet. Named for something he actually likes, not just for his powers. Just wonder what would happen if his original powers came back eventually. Now THAT’S a scary powerful person. God-like Superman-level, in fact. Ever read or watched “All-Star Superman” by Grant Morrison and Frank Quietly? It goes back to the funky sci-fi stuff of the Silver Age Superman. Superman is FISS (of course), but it’s his super senses turned up to wazoo that makes him truly superhuman. He can see atoms and beyond. Ron just having these quantum mechanics vision powers + FISS would turn him into Superman at his most powerful. Here’s a clip of his final battle with Lex Luthor in it: youtube.com/watch?v=9RfUUJH2TvU. Lex had managed to steal a formula from Superman that granted Superman’s powers for 24 hours. Beyond the sheer might of it all, in the end, as the effects reach their peak, Lex truly finds out what it means to be Superman. Am I the only person unaware that “All Star Superman” had been made into an animated movie? I said that back during the carney games! Bonus points for me! I’m disappointed that Zodon didn’t start singing something from Little Shop of Horrors here. So what exactly happens when Flea gets sick inside his mask? That number three? Most gamers I know would’ve led with that. Hmm wonder if Toby’s “murphy law effect” accidentally gave powers to Ron instead of Tyler? Then Toby would have had to have done it before Issue 51, ‘coz Cecil had detected his still having metahuman powers at the end of it (update 05302014). * Furthermore, we were getting hints of said other powers in this story arc. * – Sigh. 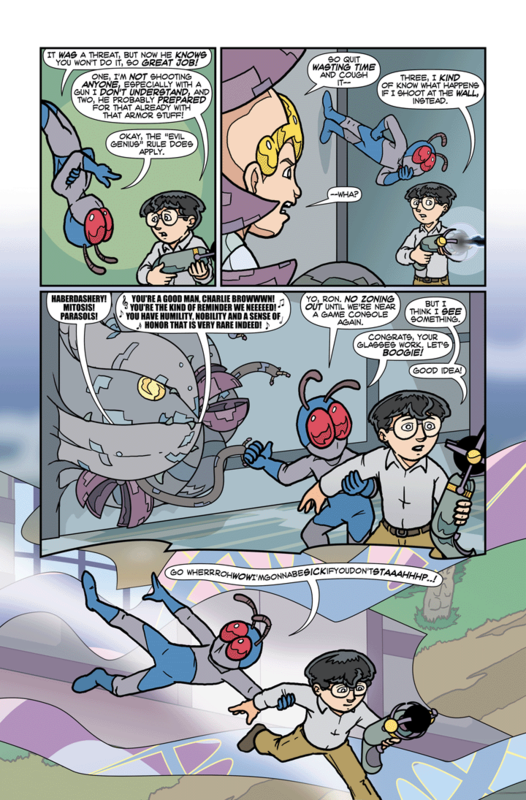 Note: the next page after this one is missing from the archives and explains that Ron’s FISS powers from his dad are gone thanks to the argonite laser but Cecil’s detecting Ron as still metahuman is possibly because he may have gotten powers from his mom instead. Come to think about it the fact that Argon killed non FISS supers it makes sense for that power set to suppress other powers. When did argonite kill non-FISS supers? Oh, sorry. You mean the government of the planet Argon. Hm. It would make sense for FISS to suppress other powers as per the Argonian policy of removing wild meta-abilities from the gene pool only if they also managed to genetically engineer such into their FISS population. I really think that’s unlikely. 1. When they treated Tyler for the invading alien virus, they had to suppress 84’s FISS power. That was just merely to make penetrating her skin possible to do a blood transfusion. 2. Argon only got Argonite after Dax-Ra was exposed to it by Atlas. It was then revealed to have been synthetic in origin. That means Argon never developed Argonite while it was culling wild metas. 3. The culling of wild metas mean that anyone who had the Rainmaker’s meta-ability-dampening powers would have been killed. That would actually make sense where it’s only the ruling class of Argon who are supposed to have powers, and then only FISS. 4. That makes artificially adding other-power suppression abilities to it unlikely. It’s possible that FISS by itself as a power set naturally suppresses other powers in a person, given Ron’s case (point in its favor). Or maybe not. It’s possible that Ron’s quantum powers themselves can’t manifest in the presence of another power set instead (I mean, it’s not FISS’s fault but Ron’s other powers’ fault). Or it could just be whatever governing mechanisms there are for metahuman abilities in the PS238-verse (which are explicitly said to be a mystery multiple times). In a world where having non FISS powers means kill on site a gene suppressing non FISS powers would be a good thing. It doesn’t have to happen on purpose. So you mean as a survival adaptation mutation? It raises the question: So shouldn’t we be seeing FISS+ metas on Earth where, such a mutation isn’t likely to arise to begin with? Yes because supers tend to marry supers otherwise the question would be if they won two lotteries. Come to think about the numbers yea if it exists its proberly either just part of the FISS package or artificial. I’m very much of the former (other power suppression is just part of the FISS set) and not the latter (artificially added). It has some interesting implications. The Headmaster/Praetorian Academy’s agenda is to prevent the birth of an Omega Level One Metahuman (03282014). Tyler, born of two very powerful metahumans, is evidence against that. But if FISS powers blocked other powers from manifesting, that would be another indication that the Omega Level One Metahuman agenda is bunk. It would mean that any FISS marrying any other meta would likely have FISS children and not something else, and that’s only if their child is a metahuman and not ordinary. Of course, it’s possible (even likely IMHO) that the Omega Level One Metahuman theory is completely untrue and the Headmaster (and Prefect) know it. It may just be Praetorian’s secondary cover story* to protect what real evil machinations there are that the Headmaster has. * The primary, PUBLICLY DISCLOSED cover story would be: “elite metahuman private school”. If FISS/super genes are passed on more than regular genes interbreeding FISS with other supers may be a solution but there being possible solutions does not disprove the problem. Also Tyler proves that not all super children always have powers stronger than there parents but doesn’t disprove the headmasters point any more than Rons dad marrying someone apparently without super powers. Heck Tyler’s son is a pretty good indication of that the Headmaster fears. That being said yea the Headmaster could be lying about his goals, or he might just be a hate group with decent sounding justification. I’m partial to “haberdashery” myself. I submit Patrick Stewart or some other Shakespearian actor be looped in to mimic the effect I hear when reading the “IMPACT” typestyle words. And I agree, btw, I would so like to see an animated PS238. I would prefer it be 2-D to match the “Silver Age” style of the storytelling, but you take what you can get. It’s got to take some doing to make someone motion sick who bounces around and hangs upside down like the Flea does. Random walk frame jump teleport? I wonder if this means Ron could actually bypass the ‘teleport jump if you don’t belong here’ around Power and Glory. 1. It was Charles’ power that got him there, just screwed up by Ron’s interference. Anyway, if Charles can do it, so can possibly someone else even if that someone else had a different kind of superpower. 2. It was Ron’s power that got Charles there. Either way, it would mean that Ron can get into Power & Glory’s store. Is that orb-gun thing somehow related to Tobey’s increasing confidence in having the side-effects under control? I bet ya’ that the orb is somehow absorbing the chaos-effect of his powers, causing the instability that Zodon detected and is trying to properly cage. I bet you that Tyler’s parents have not told the other members of their Justice Club and I wonder what the heck they will be willing to do to keep that secret! Or I’m completely wrong, but it would have been a cool plot twist too, right? Either way, first time comment here. I really am a big fan of your work! Seriously, it’s been nearly a week now and nobody else has commented on it? Why does the Flea have gray shorts in frame 1 and blue shorts in every other frame of the comic? probably a mistake. You try drawing for a living and not having your pants change. The blue is a liquid colour. In frame #1 Flea is upside down, and the blue moves up his chest. After what he’s seen, I’d want to change my pants too! Is it ossible that Ron’s power is to borrow the powers of other supers? It looks like he I using Charles’ powers there and Charles he did touch Charles as he was teleporting. That would also explain how he messed up Charles’ attempt at teleporting. That would also explain why Cecil didn’t initially detect Ron’s power, because it hadn’t been activated by that stage. How often are new pages usually posted? I only just started following the strip and i HATE WAITING!! !